This sculpture is made out of found materials (the wood base and nails), burlap, house paint, fencing wire, acrylic paint. This piece refers to the tight bonds of family, for better or worse, that remain with us no matter how we personally relate to our family. There is a constant tension stringing across blood lines forever connecting families and sometimes this is one’s greatest asset while at other times it is a detriment. 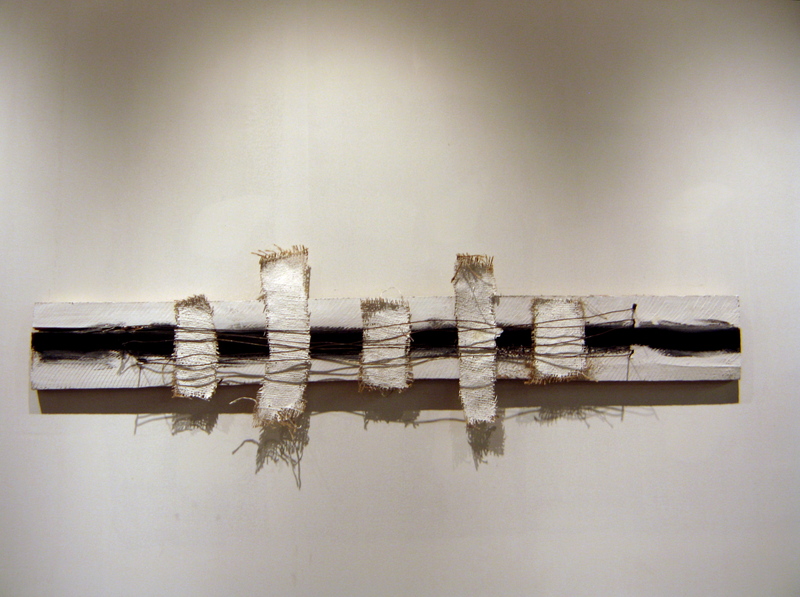 The separate pieces of burlap indicate individuals, while the common background and wire strung across the front shows them inextricably linked. While survival in parts of the west requires fierce individualism, it can also be the greatest challenge to overcome when others are inevitably involved. Meg, I can’t tell you how much I love this piece. I’m in awe of you. Hope all is well…..